Have you ever worked on a complicated Simulation study with many thin components meshed with shell elements? If you have, you’re familiar with the face colors for shell elements – silver for the top face, orange for the bottom face. The face colors provide a visual link from the 2-Dimensional representation of our part back into 3-D space. At some time, you may have encountered ‘top’ and ‘bottom’ faces in the mesh being adjacent to one another, or a mis-alignment of the shells. 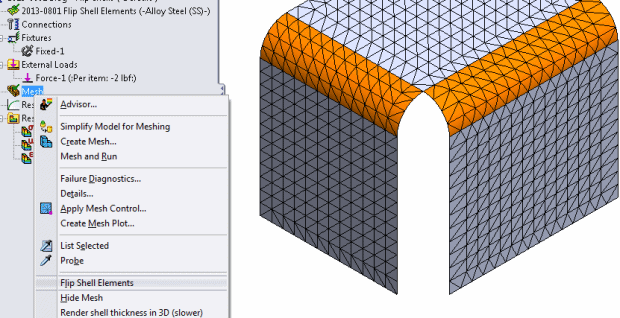 To re-align the shell mesh, select a face from the graphics window, move the cursor to the Mesh icon in the Simulation feature tree, RMB on Mesh, and choose ‘flip shell elements’. Now that you know what to do, here are three tips for dealing with shell alignment in your mesh. The first is to use a Simulation default option to align the shells. From your pull-down menu, choose ‘Simulation… Options…’ then click on the ‘Default Options’ tab and then click ‘Mesh’. 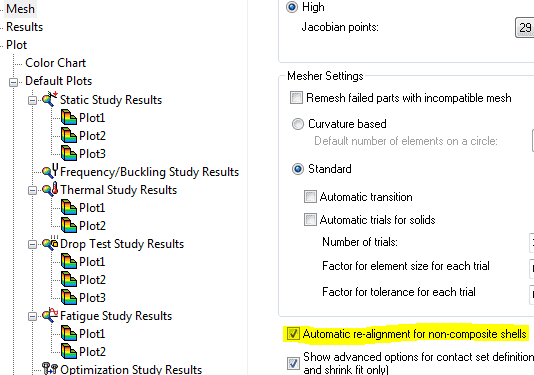 On this options page, check the box for ‘Automatic re-alignment for non-composite shells’. With this Simulation option set and the shells being automatically aligned, you may still want to flip the orientation of the shells in your mesh. I’ve already described the procedure to manually flip the shells, and that requires a lot of mouse travel. My second tip is to set up a Keyboard Shortcut for the ‘flip shell elements’ command. With either a part or assembly open, you can access the Customize options via ‘Tools… Customize…’, choose the ‘Keyboard’ tab, and then set the Category to ‘Simulation’. This is a much faster option than moving your mouse to access the command. 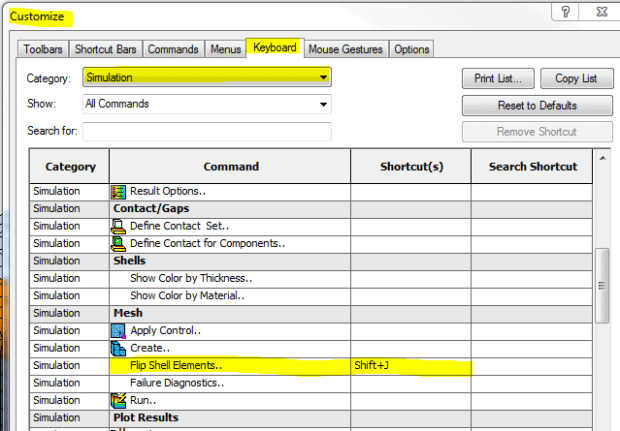 Finally, the third tip for ‘flip shell elements’ is to set up a Mouse Gesture for accessing the ‘Flip Shell Elements…’ command. 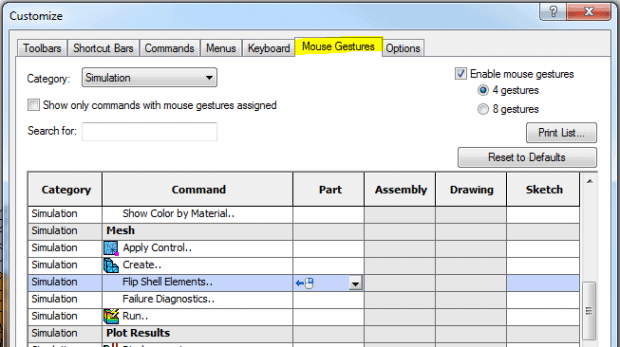 Mouse Gestures, like Keyboard Shortcuts, are accessed through your Customize menu. Regardless of whether you choose a keyboard shortcut or a mouse gesture, both options will greatly reduce your mouse travel when you use ‘Flip Shell Elements’. What other mouse travel reducing tips do you have? Now go make your products better – faster – with SOLIDWORKS Simulation!